You are here: Home » Category: "2016"
It took a while, mostly due to me being slow at getting things sorted out, but Bliss got their share of the £1600 that we raised this year. A huge thanks to everyone who bought from the bring and buy, entered the raffle or just threw cash into the collection bucket. After a stellar performance by Cooper, ably assisted by Cal, this year’s videos are the best ever. What made it even better was the live streaming on the day for those who couldn’t physically attend. Thanks to Chris Ratcliff for doing the photography on the day and to Jamie Duxbury for giving us the shots he took. Due to “age restriction problems” on Flickr we’ve moved to hosting the photos with Google this year. We will probably move the old archives over at some point as well. This year’s goody bags contained an amazing build-it-yourself combination lock supplied by Madbob. For those who haven’t managed to work out how to build it themselves yet, here is a video the team put together for you. 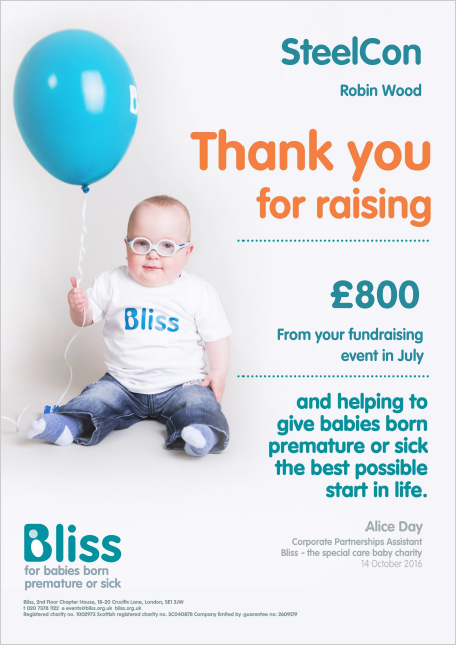 Last year we ran a “bring and buy” table for IT and security related books, raising £100 for the premature baby charity Bliss. We are running the table again this year and extending it to include hardware. Do you have old kit lying around at home, collecting dust that you think might be valuable to someone else? If so, bring it along. If there is something special about what you are bringing, such as the power supply is dead or there is a loose connection somewhere, then please bring a note to put on it so people know what they are buying. If you’ve nothing to bring, make sure you’ve got some cash on you and space in your bag or car so you can take something home, as all proceeds will go to charity.